Those with naturally frizzy or textured hair know what it's like to reach for a flat iron day in and day out for a smooth finish. I one of the quickest ways to achieve shiny and uniform locks, but it can be quite damaging to hair over time. Even when paired with heat-protectant, hair is at risk of becoming dry and losing its natural texture. Even if you can only manage it once a week, give your hair a break from the iron. Self-adhesive rollers allow you to leave home with salon-worthy straight hair, without the risk of frying your locks. Wash your hair with a straightening shampoo and rinse completely. Shampoos containing keratin and argan oil are best as they smooth and strengthen the cuticle for a long-lasting style. Apply deep conditioner to your hair from roots to tips and leave on for 5 minutes before rinsing well. Opt for an oil-based product that blocks humidity. Use a microfiber towel to gently squeeze the ends of your hair dry. This will remove excess moisture without causing dryness. Work a dime-size amount of anti-frizz serum through your hair from mid-length to ends. Comb your hair from roots to tip with a wide-tooth comb to detangle and evenly distribute product. Place a large self-adhesive roller underneath the end of a 2-inch section of hair, and roll it to your scalp. Select 2- or 3-inch rollers for the best smoothing. Use a hair clip to secure the roller to your head if necessary. Thicker hair often needs a bit of extra help staying in place. Roll all remaining hair in rollers, using 2-inch sections. Allow your hair to air-dry completely. All moisture has to be removed in order to lock out frizz. 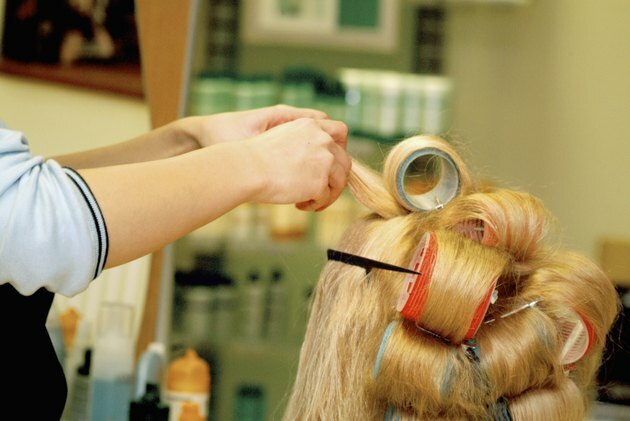 Remove the rollers once hair is dry. Gently brush hair using a natural-bristle brush to smooth and add shine. Hold a can of anti-humidity hairspray 10 inches away from your head, and coat hair from roots to tips to seal the style. Thick hair will take longer to dry than fine hair, so consider styling hair at night in this case to save time. To speed up the drying process, lightly lift your roots with your fingertips before rolling hair.